This post is going to be split into two sections, bath and body and make up. All products listed are items which I'm constantly running through (so much so that I usually have multiples) and can't find better replacements for. I've never not loved a product from their line and my bathroom is running out of space for their pretty pink packages. But what's a girl to do? My first Soap and Glory staple is the lovely Clean on Me shower gel. It comes in a handy pump dispenser and a few squirts is all you need for a shower experience that is out of this world. It's been a guest in my shower for just over a year now and in that time I've not used any other; why would you want to? It's a mild pink (?) creamy gel which lathers into mountains of bubbles, cleaning skin effectively whilst moisturising it too. Yes that's right it moisturises too, thanks to the "bonus built in body lotion". The scent, well it's simply divine. It's scented with the original pink fragrance which Soap and Glory describe as "a fresh fruity citrus with notes of bergamot, summer rose, peach, strawberry, gardenia blooms, jasmine, patchouli, warm amber and lush musks". All I can say is it smells simply lovely; not too overpowering and sweet and girly too. Just lovely. I'd thoroughly recommend this to anyone who would listen, it's a godsend. Another major bonus is that it lasts so long! The 500ml bottle can last a ridiculously long time, I've managed to make a bottle last over two months without scrimping. It's incredible value when compared to other brands of shower gel which when compared require more product to achieve the same lather. Just fabulous and as a student it means I can enjoy an indulgent bathing line which for me is also cost effective. This simply has to be Soap and Glory's Flake Away. It has a granular enough feeling for me to be sure that it's actually exfoliating my skin effectively (I've experienced some products which purport to exfoliate but do nothing and leave an annoying film on the skin). Once more, this carries Soap and Glory's signature pink scent which I adore so that's the scent box checked. As for its exfoliating capabilities, the blurb states it "transforms your scaly legs from reptilian to radiant" and I think this is a completely justified claim as my once scaly legs are smooth, shiny and soft. And with summer just around the corner (yes the grounds covered in snow but a girl can dream!) it's the perfect investment to get pins ready for the beach. Like the shower gel, this product can also last a long time it just depends how often you like to or need to exfoliate. I typically use it three times a week as my legs need all the help they can get. Based on that usage, a tub can last just over one month so once more it isn't bad value for money. However, despite doing an amazing job on my legs, the formula can be a little too harsh for the rest of my body and can cause redness. However this is just my skin and I'm sure not everyone will have this kind of reaction (my skin is notoriously sensitive). Aside from that one tiny issue, their body polish has been a great addition to my bathroom cabinet. It does everything you would want a body polish to do: it exfoliates and it smells great so I see no reason not to love it. Shock horror, ANOTHER Soap and Glory product, think I may have a slight addiction here. It's the one and only Righteous Butter. Unsurprisingly it has the original pink fragrance, once more I love it so I'm not complaining. In respect of the formula, it is a rich, thick moisturiser which I think does actually have the texture of softened butter. Despite its richness, unlike other body butters it doesn't linger on the skin for too long and absorbs relatively quickly (again this will depend on how much you apply). I have dry skin, particularly on my legs and this has worked wonders to alleviate it and I can now see a dramatic improvement in the sense that regular use has stopped my legs becoming dry and flaky. Brilliant! I find it's particularly useful when tackling the dryness that people usually experience throughout the winter. It locks in moisture, keeping the skin smooth and supple, keeping snakey skin at bay. Unlike the other two, I find this to be one of the least economical of the Soap and Glory line, I don't feel like I'm using too much product and I only use it three or four times a week yet a tub only seems to last three weeks tops. When you consider the price of a single 300ml tub when not on offer, this could add up to an unhealthy price tag so this is my treat product in my regime. However I wouldn't use anything else as I've wasted enough money on second rate moisturisers in my time. Also, I know Boots regularly have offers on Soap and Glory so be sure to keep your eyes peeled! I think from the above it's been established I have a Soap and Glory addiction or obsession. From the cheeky packaging to the products themselves, I simply can't get enough. It also doesn't help when Boots have the fantastic Big Splendour as one of their Christmas offers of the week; I now have more products that most people buy in one year! But at least I'll never stop smelling good =). When it comes to cosmetics, I focus less on the price and more on whether the product can actually do what I want or need it to do! As after all, there is no point in buying a product for the brand, getting it home and finding it's about as useful as a chocolate fire guard. Consequently, my cosmetics collection tends to be an eclectic mix ranging from premium beauty to own brand basics. 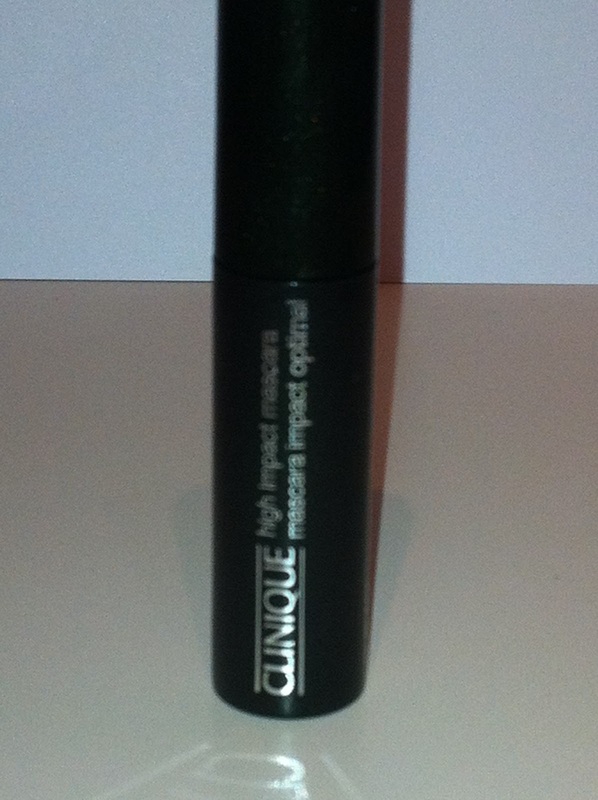 Primer: I am currently loving the E.L.F mineral infused face primer which comes in a not so handy pump bottle. On first impressions, the packaging looks quite appealing and not as cheap looking as you would expect for the price. So a good first impression, but what of the product? Well I was pleasantly surprised, due to the price I wasn't expecting a perfectly airbrushed canvas, but that's what I got.The primer itself is a thick, clear gel which is smooth to the touch. I simply dot it on my cheeks, forehead and chin and smooth it all over my face. It provides a good base for applying liquid foundation and I must admit it does improve the appearance of the foundation on the skin. For example without the primer, my foundation would sink into the pores around my nose making them more noticeable. The silica in this formula prevents that and I love it. The price also isn't too bad with one bottle costing £6; for a primer that actually works I don't think this price is too bad and it can last a while if you don't use too much product. Despite being a fantastic product, my only gripe is the pump bottle! The first few uses it's completely fine and dispenses the product well, but not so long after that it ceases to work so you have to take the top off and try and scoop it out.. This may sound simple enough but it's a hassle due to the actual inners being very narrow. It's also quite difficult to see when you have ran out of product. That aside, the actual product itself works wonders, I just think the packaging could be improved significantly and then I might get on a bit better when getting it out. Foundation: This one has been a particularly difficult cosmetic for me to get right; I've tried mousse, mineral and a whole bunch of liquid foundations. But like Goldilocks I've finally found one that is just right. It's the E.L.F Flawless Finish Foundation from their Studio line and it retails for £6.50 which compares with what Boot's charge for their own brand foundations (only this one actually works). The foundation is available in 6 shades and I know they can be mixed if you skin doesn't perfectly match the available shades so there's something for everyone. I'm incredibly pale so I use the shade "Porcelain". Due to previous disappointments, I don't generally expect much from foundations as they usually make grand claims that they can't match. This one simply claims to "achieve a flawless complexion" and I believe it does. It provides the amount of coverage I need and for once the shade matches my skin tone perfectly. I've struggled with my skin tone in particular as even the lightest shade from other lines has made me look like an oompa loompah so well done E.L.F you've made a pale girl very happy. Two huge pluses for me are also the fact that is contains SPF 15 and is oil free. The first simply because I want to avoid any kind of sun damage to my skin where possible (I use SPF moisturisers so I always look for the same in my foundation) and the second because I have awkward combination skin which means my t-zone can look like an oil slick come dinner time if I use products which add oil to my skin (and no one wants to see that, least of all me). Put simply, where does this foundation go wrong? The simple answer is, it doesn't. I am hooked and if they ever discontinued it I don't know what I would do. Powder: This is a product I'm not too fussy about to be honest. 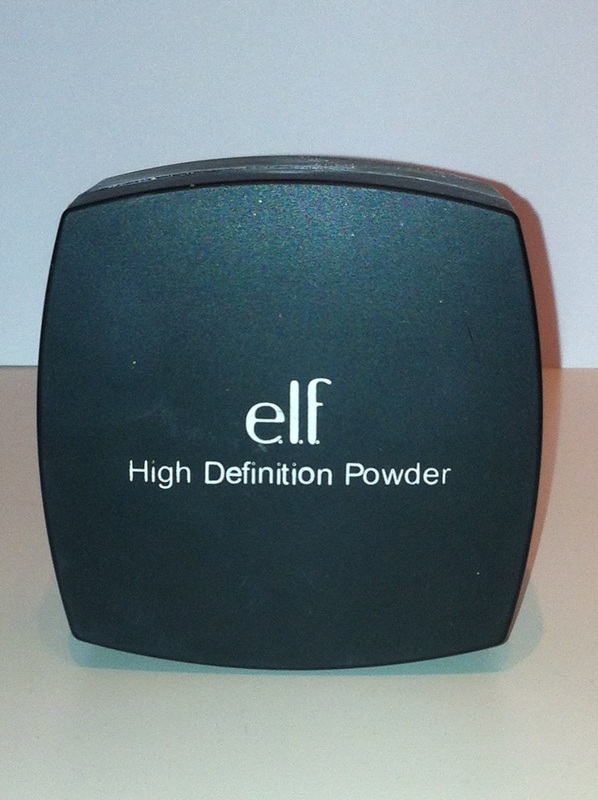 I usually opt for a transparent power or the palest one available but then I discovered E.L.F HD Powder. It's a finely milled white powder which when applied right can create a camera ready look in an instant. Unlike other powders, the HD powder promises to "mask fine lines and imperfections". While I can't comment on its ability to mask fine lines, I would say that it can improve the appearance of imperfections. For example if I can still see pores and sweep this powder over the area, they are a lot less noticeable. So this powder can mattify and beautify all in one. 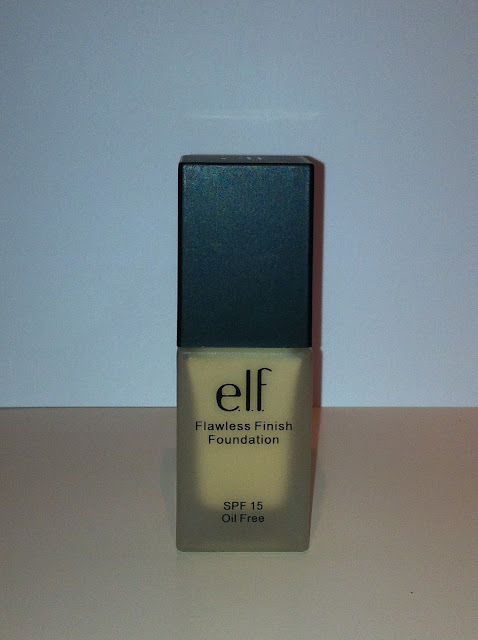 For me its a nice little multi-tasker and is great as a product, but once more E.L.F's packaging is an issue. The product comes in what can only be described as a large square pot. It's certainly not ideal for putting into a handbag or a clutch when you're on a night out (Of course you can depot it and create your own travel size). The packaging itself does have a nice, luxe appearance to it but the sheer size of it, for me makes it unpractical. Made more annoying when you realise that despite the size of the pot, there isn't that much product inside. But going solely off the products performance, I've no doubt it will remain a staple despite the packaging. Mascara: It might just be me but i generally find that no matter where I got it from, all mascara's tend to have the same effect on my lashes. My favourite however it Clinique's High Impact which costs £16, I've been using this mascara since I was 14/15 years old and I've never changed the way I feel about it. It glides on easily, the brush gives the lashes volume and length and after wear the formula is super easy to remove (unlike Diorshow). Plain, simple and does the job. Lips: The same pretty much also applies to lips, they all generally have the same effect so I don't tend to prefer one brand over another. However there is one product that can constantly be found lurking in my make up bag and that is the Body Shop's Born Lippy lip balm. They have a lovely texture which isn't too sticky or too wet (it actually feels like a balm) and they smell amazing. They have a whole range of flavours available but my favourite at the moment is the mango and peach one. It smells good enough to eat. These little beauties cost £2 each and last so long it's ridiculous, you've tried the rest, now try the best! And with Valentines day coming up, there is no better time to get your lips perfect for puckering.